Whilst we are in the National Forest we wanted to try to incorporate a few activities alongside getting outdoors and recharging our batteries. There is so much to do in the surrounding areas but we didn’t want huge drives every day and really wanted to remain within the confines of the National Forest. On looking at the internet we came across the National Forest adventure Farm. 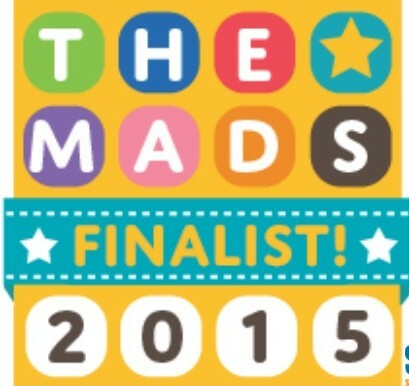 With animals, lots of extra activities and an award-winning attraction, this sounded right up our street. The Farm was awarded the Staffordshire tourist attraction of year in 2014 and after visiting we can fully understand why. 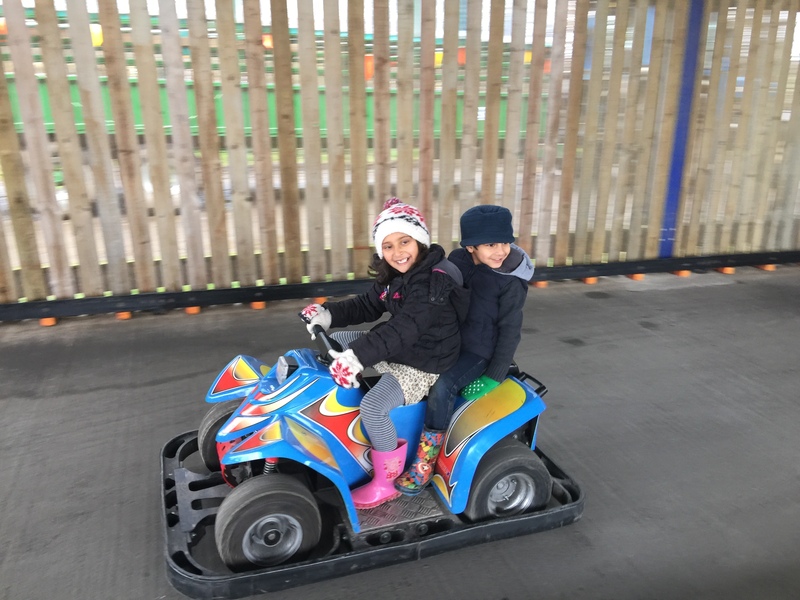 The farm is open all year round and offers lots for visitors to do from lots of animals, to indoor play areas, to bouncy pillows and go karts. There seems to be something for everyone. We visited the farm on the first day of the school holidays (14th February). For me this was the perfect way to spend Valentines Day, with lots of smiles, happy memories created with my little adventurers and some great family time, forget the flowers and other gestures nothing shows love like a good day of old-fashioned family fun . 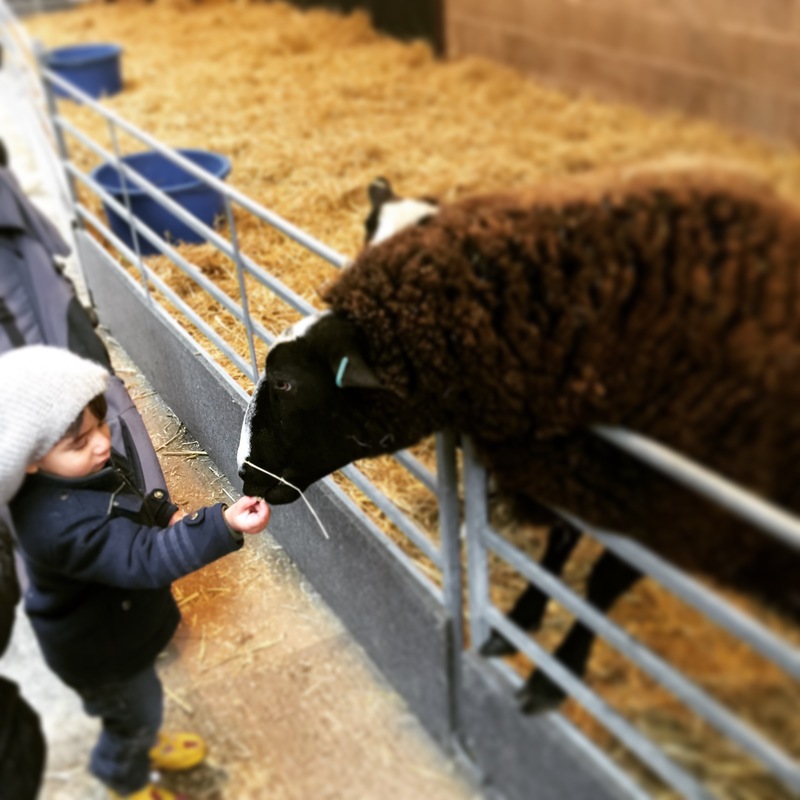 Entrance to the farm is £10.75 per person (aged 2 plus) under 2s are free. Even though this may be higher than some basic farms that are out there, you do get a lot for your money and I have been to some farms which charge well over £12 per child over holidays so in comparison this is really good value for money. At the entrance you are able to buy animal feed, there’s two separate types, duck, hen and chicken feed and then feed for cows, sheep and pigs. Purchasing their animal feed the little adventurers went to seek some animals to fatten up! The first stop was the duck pond. 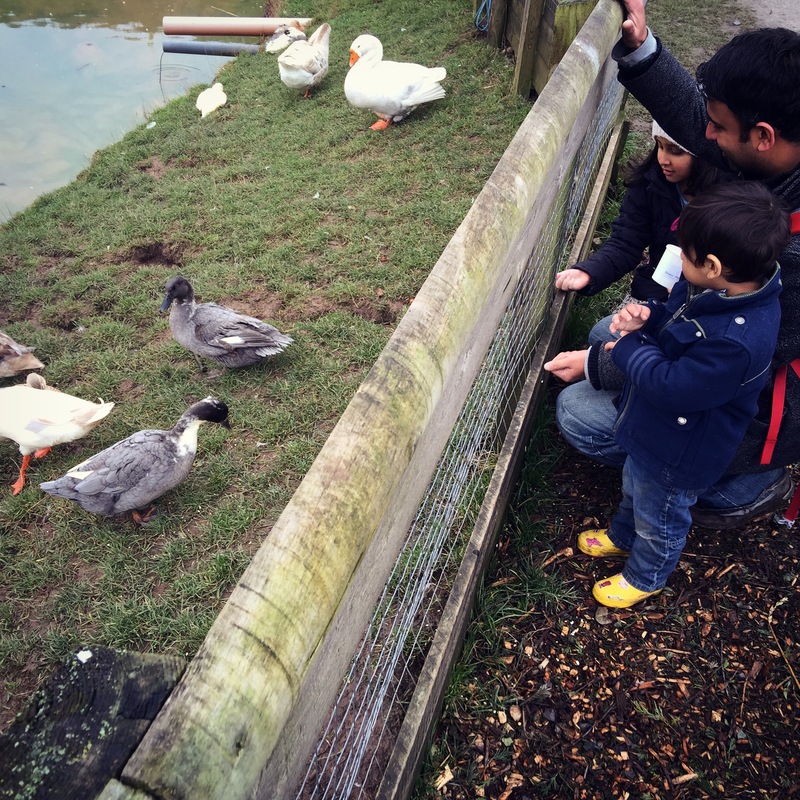 Maya managed to hand feed some ducks to her delight and it’s always nice to see when the animals are receptive to the feeding. I compared this to the visit to the South Lakes Zoo when the children got no reaction from the animals and despite their best efforts they were so disappointed. One of the highlights of the day was seeing the sheep. The farm are running a lambing live sessions (I was a little worried about this session as thought it would spark a whole host of questions from our ever inquisitive Maya and I wasn’t sure how to address these). However, no lambs were born during our time at the farm but it made for some very hungry ewes. They were really eager for feeding and Maya and Zayn had lots of fun feeding them. I love this photo of Zayn feeding the sheep, its one of my highlights of the day. 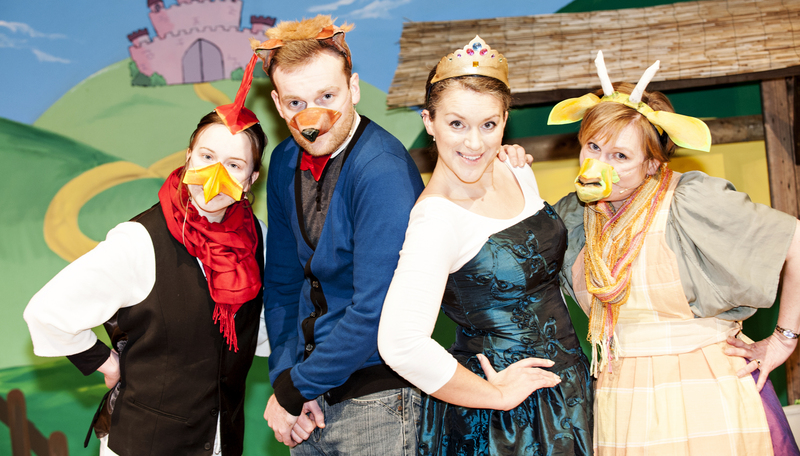 Over half term there are additional arts & crafts and a panto show for the children to enjoy. The children all had a go at making masks and there were lots of colouring pens and pencils, decorative things to stick and jazz up the masks for the little adventurers. That is a pet peeve of mine when supplies run short and the children are really disappointed. The farm had a designated person with the activity and the little adventurers loved making the masks. Over half term there is a special show on during the day, so the next stop was the panto which was titled “Farmyard Fairy Tales”. Before the showing the characters all came to greet everyone outside and the children loved to see them. The panto itself was really well written. I loved the fact that the wolf (I am very much team wolf) was a really nice character and totally misunderstood. The panto did use the common fairy tales and put on a funny twist on them. Doc and I loved the panto and the characters were really interactive with the audience. However, the length of the show was nearly an hour and was a little complicated for the younger children in parts. Also I think if they also had the children having a bit more of a dance around the smallest of children would have been occupied until the very end. There are places to eat within the soft play area and the farm have a marquee up with heaters so those with picnics didn’t have to eat outside in the cold. That was a really lovely touch as we always have a picnic packed and its horrible eating outside during the winter months. 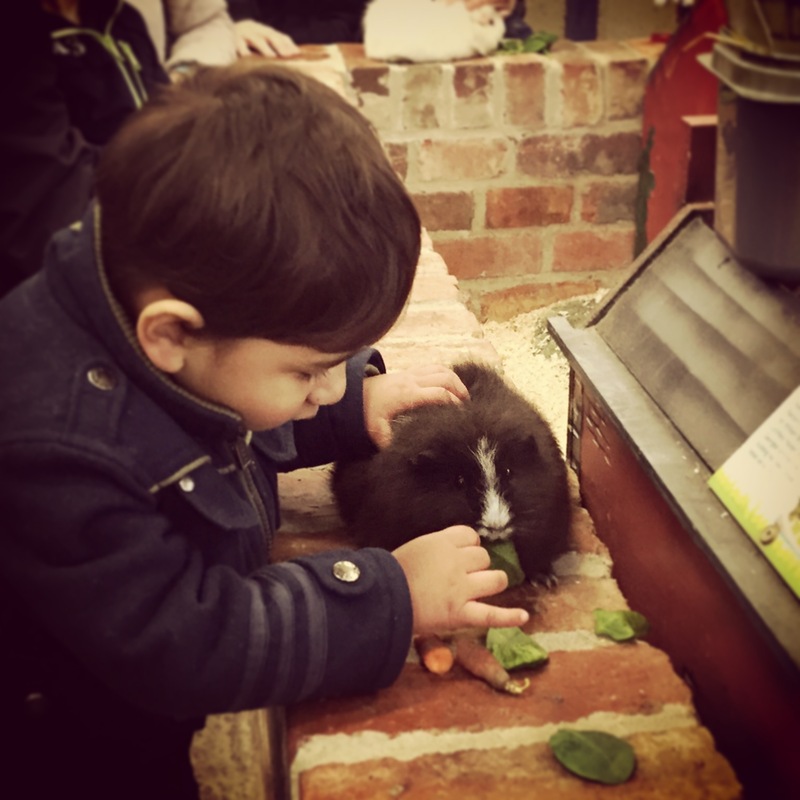 The farm has lots of hands on animals experiences from pony grooming, to feeding baby lambs to collecting eggs. However, these are at various points during the day so it’s always with checking the timetable of activities so you don’t miss anything that the children would enjoy. We missed out on the lamb feeding but went to the pet handling time. The sessions are only on twice a day and the children were really excited about this. We have been to a few farms who have these or similar sessions on but disappointingly the children are not able to hold the rabbits or the guinea pigs. They were able to feed the guinea pigs but could only pet them. I think it was a real shame as I think it is an opportunity lost. 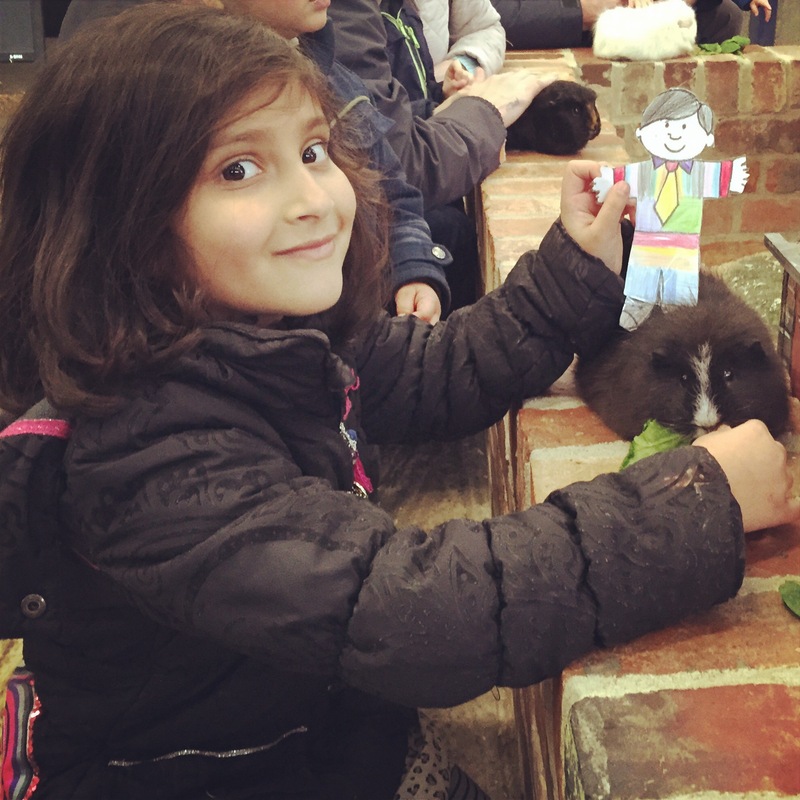 The staff member explained that the rabbits don’t like being held but I think the children were a little confused as there are lots of photos of children holding animals in the leaflets and posters around the site. For me this was the only aspect of the farm which I would improve as having a more interactive animal handling would round off a fabulous farm experience. In the grounds around the farm there are also outdoor animals to see and a whole host of other activities. The little adventures loved the barrel ride and the bouncy pillow. 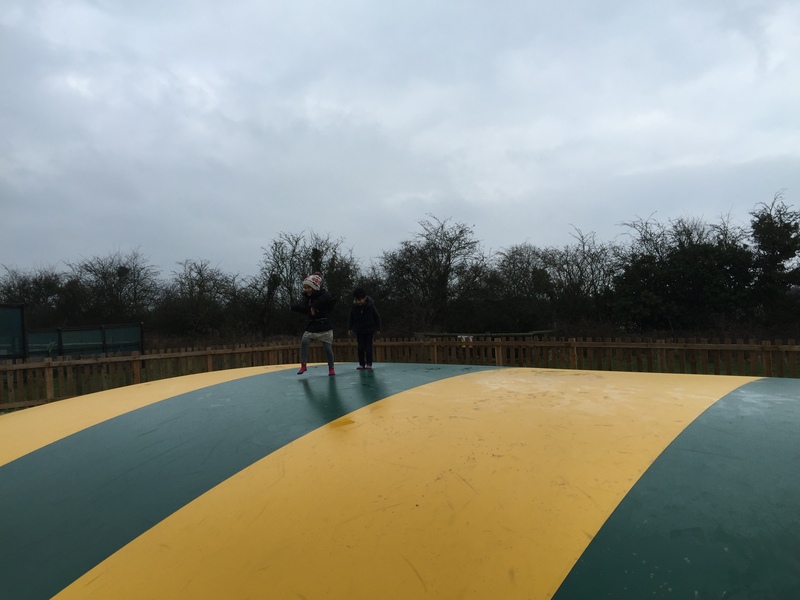 We loved the idea of the bouncy pillow and think it would be awesome in summer. Also, having two of the pillow, one for everyone so allowing parents and children to jump together and one only for under 8s meant that everyone could enjoy the fun! There are also go karts, crazy golf and Frisbee golf to enjoy so plenty to keep adventurers of all ages entertained. Our last stop on the day was the indoor play area. And what an indoor play area it was. The slides were crazy drops, some literally vertical. You could happily spend hours here with the children and I am sure they would not get tired of the great sides. Great touch was that adults were able to go on with the children. One thing I really struggle with is having a little boisterous toddler and then not being allowed onto the soft play frames. Here there was a member of staff watching over the play frames and parents and children alike were happily enjoying it. 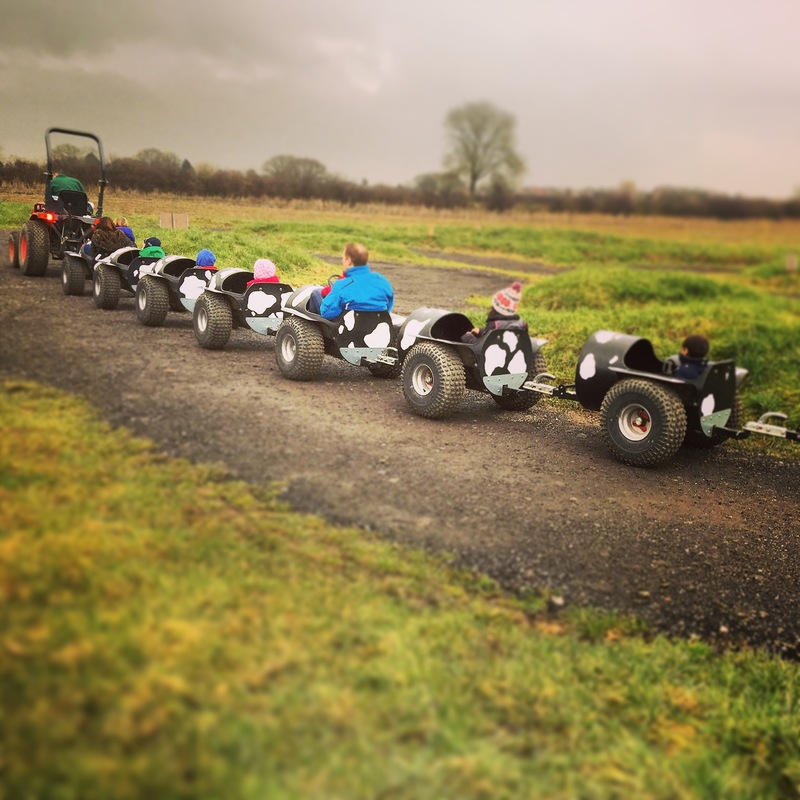 If you visit the farm you are guaranteed a fab day out. If you have animal lovers there is lots to see and do and getting hands on which is what I like to see. 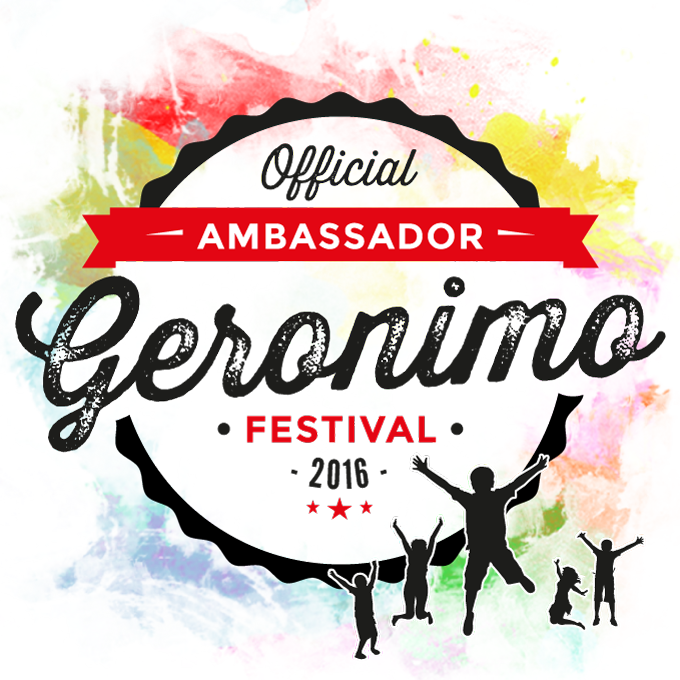 There is a packed day of activities, it’s just a matter of trying to fit it in all into one day. 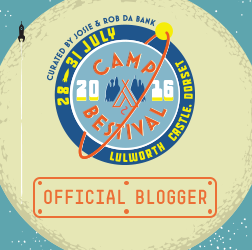 We were hugely impressed with the farm and would recommend it to all who are visiting the area. 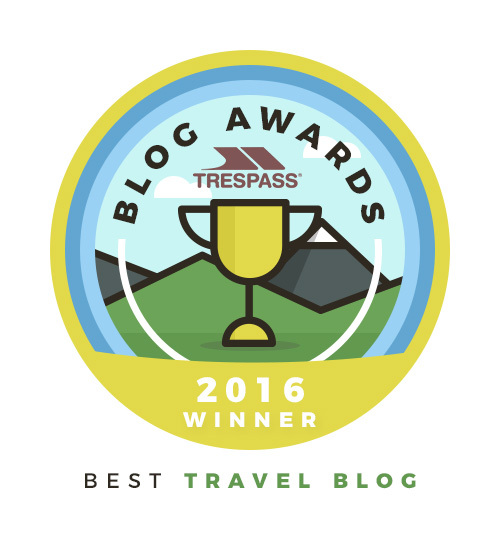 It is definitely good value for money and you can easily spend a full day here!